He was "a brother, a musician, an entrepreneur, a people's champ." 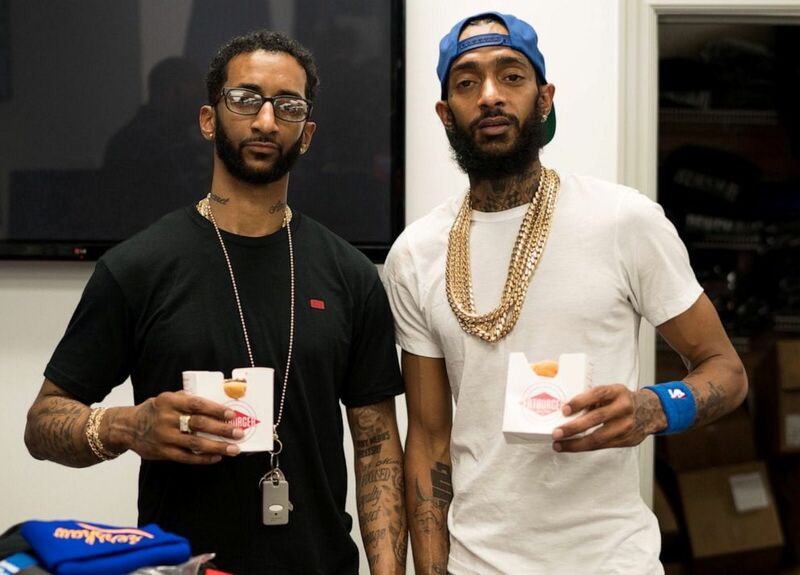 With a voice filled with raw emotion and quivering with grief, Samiel Asghedom reflected on how he will remember his younger brother Nipsey Hussle days after the rapper's tragic death. "He was a brother, a musician, an entrepreneur, a people's champ," Asghedom told ABC News in a phone interview on Wednesday. "He was somebody that believed in the process of hard work, determination and just the positivity of somebody staying in the area that he grew up in and making something out of nothing," Asghedom said. "... he was a role model to the community, to the kids, and to the mothers and the grandmothers and the community that watched him grow up and seen him as a youngster, (and now) a family man, a father, raising his kids." The Grammy-nominated rapper, whose full name is Ermias Asghedom, was an artist, an entrepreneur and an activist who was deeply dedicated to his community. He died at age 33 on Sunday after he was shot multiple times in the head and torso while standing outside of his clothing store, Marathon Clothing, near LA's Crenshaw District, where he grew up. He was rushed to a local hospital, where he later died. He was a father to two children, his daughter Emani and his two-year-old son Kross with his girlfriend Lauren London, who has been devastated since his death. "I am completely lost I’ve lost my best friend My sanctuary My protector My soul....I’m lost without you We are lost without you babe I have no words," she wrote in an Instagram post. The suspect in Hussle's fatal shooting, Eric Holder, was captured Tuesday afternoon. Los Angeles Police Chief Michel Moore said that while Holder is believed to be in a gang and that Hussle was also involved in gangs as a youngster growing up in Los Angeles, the slaying stemmed more from a personal dispute between the two men. The Roc Nation artist's murder shocked his family and friends, the community in south Los Angeles and as the news broke messages of disbelief and condolences poured in from every corner of the hip-hop world. "People came to celebrate and show support, just come to see what a youngster from the area did on his own with no help," Asghedom said, reflecting on the tens of thousands who came to pay tribute to his brother in Crenshaw and beyond over the past few days. "He pulled himself from his boot strings, laying roots through everything — police problems, as a black male trying to grow up and be enterprising, we face a lot of things in the community, you know, the politics within the hood, just hate. He transcended everything and just stayed there and became a beacon of light." 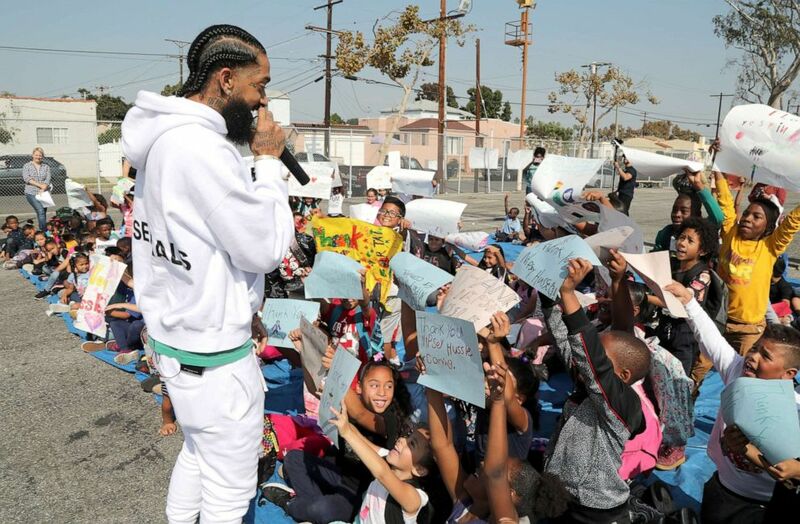 And in those emotional and reflective messages, a persistent theme emerged as artists, friends, public officials and fans lauded Nipsey's entrepreneurial spirit, his strong connection to his roots and his unwavering dedication to his community in south LA, particularly his passion for empowering the youth. People always asked him, "Why do you have something in this area? Why don’t you leave and do something else?" his brother told ABC News, "but he was murdered while he was in a parking lot, hanging out, selling CDs and that’s the area that he felt attached to and did everything in the area and ended up buying a lot and rehabilitating, opening up businesses and just became a landmark for everybody." According to his brother, Hussle owned many businesses in his neighborhood, including Marathon Clothing, the co-working space Vector 90, Steve’s Barbershop, Elite Human Hair, a cell phone shop called Wireless Connection, restaurants Baba Leos and Fish Shack, he had a partnership with Fatburger in Crenshaw, Marathon Studios and his own record label, "All Money In Records," a name that according to his friend and his business partner Karen Civil, represents his belief in "keeping the money inside of the community." "You lead by example and he did that with the way he taught you about understanding entrepreneurship, business, understanding black capital, creating value, owning real estate ... that's what he called 'husslenomics,'" Civil, the CMO of the Marathon Agency, told ABC News in a phone interview on Wednesday. "When he went to the studio it was his studio, when he went somewhere to eat, it was his business, when he went to get a haircut, it was his shop. He took ownership, he was very serious and he wanted to break the cycle that we cannot own, that we cannot provide." 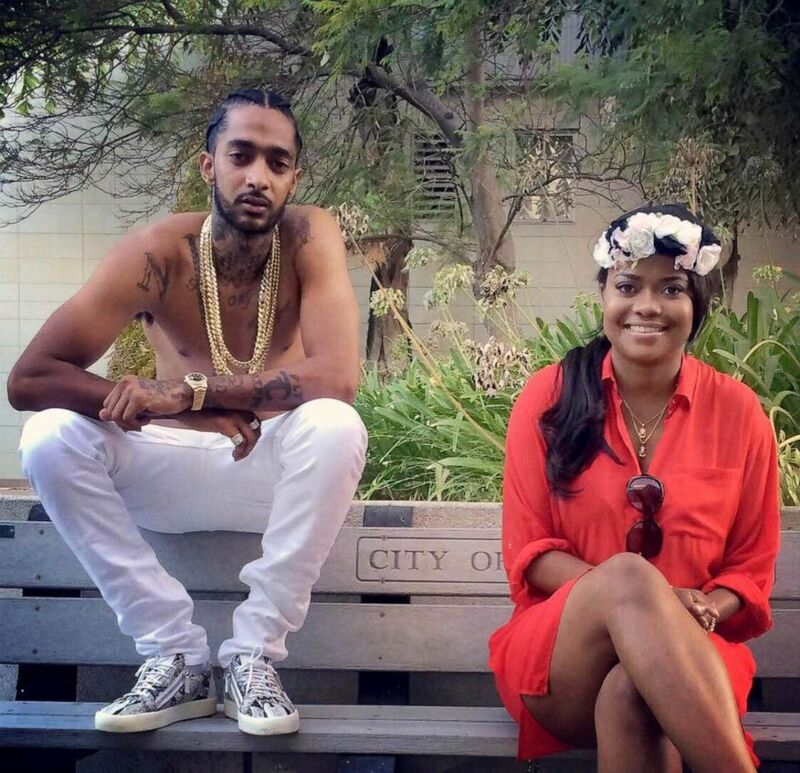 (Courtesy of Karen Civil) Nipsey Hussle and Karen Civil. Civil first met Hussle in 2010 and once she moved to Los Angeles in 2011-2012, they worked together on various projects. In an emotional interview, Civil reflected on his loyalty and commitment to his friends and his family, his love of books and his generous spirit. "He never wanted to be the only millionaire, the only intelligent person, he wanted everyone to succeed. If it started with him, he made sure to pass that book back, to pass that information made to make sure that as he grew mentally, others grew as well," Civil said. "Nipsey was the epitome a father, a friend, a confidante, somebody who believed in you," she added. Marqueece Harris-Dawson, a member of the Los Angeles City Council, witnessed the rapper's dedication to his community firsthand when he worked with him on Destination Crenshaw — a 1.3-mile open-air museum showcasing art and culture to revitalize and recognize black Los Angeles. Harris-Dawson told ABC News in a phone interview on Tuesday that he first met the rapper in 2013 and once he joined the city council in 2015, they worked together on various community projects in south LA. "Before I was on the city council, I met him at a rally against gun violence at Crenshaw High School. I remember it was very early in the morning on a weekend and so I was a little surprised to see him. He shared his story and talked about what he wanted to accomplish, who he was and what he wanted to become," Harris-Dawson said. "One of the things that stands out to me is in LA you meet a lot of celebrities," he added. "I’ve never encountered a single person who described him other than a joy and painless to work with and work for. I was impressed with the extent that he remained aggressively and unapologetically authentic ... a true son of the community and a man of the people." California Rep. Karen Bass, who represents Nipsey's district told ABC News that he will be remembered in his community an entrepreneur and "someone who selflessly gave back and invested and enriched and cared." "Nipsey was a proponent of community development at the real estate and intellectual level," the congresswoman said. "In real estate, he was all about empowerment, specifically when it came to the economic opportunity in South LA – being a part of the opportunity by becoming a real estate owner himself and immediately using the stores he opened as opportunities for employment for the community." Nipsey, who has spoken publicly about his involvement with the Rollin' 60s gang — one of the biggest Crip gangs in Los Angeles, was also was an advocate against gun violence and has addressed the issue in his music — from his first single "Bullets Ain't Got No Name," to his latest album, "Victory Lap," which was nominated in the best best rap album category at the Grammys last year. He was scheduled to meet with the city's police chief and the president of police commission on Monday afternoon to discuss ways he could help prevent children from getting involved in gangs. "We (@LAPDChiefMoore and I ) were meeting , at the request of @NipseyHussle with him and @rocnation tomorrow at 4pm to talk about ways he could help stop gang violence and help us help kids. I’m so very sad," LA Police Commissioner Steve Soboroff tweeted on Sunday. "We're talking about programs to help underserved kids, to keep kids out of gangs. And this was his idea. We've been working on this meeting for three months. How I wish it would have been on Saturday," Soboroff told ABC News on Monday. The meeting was set to take place one day after the rapper was fatally shot himself outside his Marathon Clothing store in Crenshaw. The store was named after his 2010 mixtape, "The Marathon," and the notion of the marathon has been Nipsey's metaphor for overcoming the struggles of life. And since his death, tens of thousands of fans posted tributes to the rapper on social media, punctuated with #TheMarathonContinues. "The pain his family, friends, myself and the city of LA is feeling right now is a testament to the impact Nipsey has made in just 33 years on this earth," Civil said. "To have witnessed such a spirit walk the walk and share himself in the ways he did will continue to inspire us all. The Marathon continues in us all." 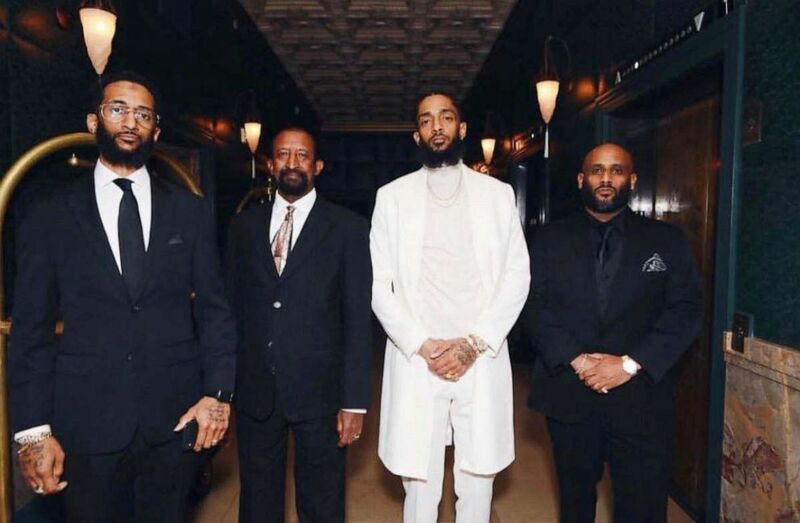 (Courtesy of Karen Civil) Nipsey Hussle with his brother Samiel Asghedom, left, father Dawit Asghedom, center, and brother Adam Andebrhan. And Asghedom, who shared his younger brother's legacy in tearful reflections, described Nipsey Hussle as "a role model to the community, to the kids, and to the mothers and the grandmothers and the community that watched him grow up and seen him as a youngster, (and now) a family man, a father, raising his kids." "Growing up, when he was a teenager -- I’m a little bit older than him, he was in the streets and gangs, trying to hustle and get money. I was trying to make sure that he’s safe and that he’s legitimate and doing something positive and that was my whole goal. You know, at the end of the day, he’s the one who actually made me have something legitimate to be able to attach myself to," Asghedom said. "... It's hard that he was killed, man. It’s hard."